Much of what is good for us humans is also good for our dogs. Diets rich in veggies, whole grains, raw ingredients, organic local-sourced foods. Bethlehem resident and entrepreneur Heather Norris has taken it one step further and developed a product for dogs that capitalizes on the calming and even medicinal benefits of something many of us have every day -- just a nice cup of tea. 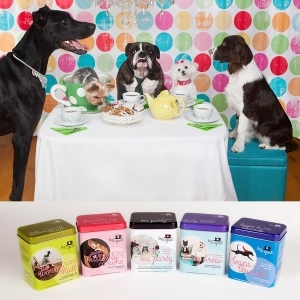 Norris has developed a line of teas specially made for our canine friends. 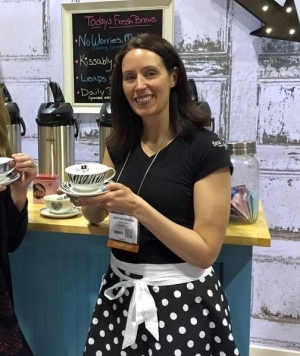 “Tea For Spot”- named as a play on words for the familiar British phrase - debuted at the Global Pet Expo in Orlando Florida in February and was welcomed with open arms, and paws, and was even voted as one of the “12 Hottest New Pet Products” to come out of this year’s Expo by Dogster Magazine. Tea For Spot is a 100% caffeine-free, locally made proprietary blend of organic tea, herbs, spices and all-natural ingredients touted as safe and dog-friendly by nutritionists and holistic practitioners. “I have always loved tea, and loved the benefits of natural herbal blends as remedies for me and my family,” says Norris, a married mother of three, photographer, entrepreneur and lover of tea. “And one day in 2007, the idea of tea for dogs popped into my head. I started mixing up blends.” But then, with the demands of life and family, the idea of tea for dogs was put aside. “It sat. But I couldn’t get it out of my head,” she explains. Fast forward a few years and a chance encounter with a new friend and fellow dog lover who was looking for a business opportunity was the spark that was needed to ignite her tea vision once again. He embraced Norris’s idea and the product development phase of “Tea For Spot” began in 2014 in her office in downtown Bethlehem. 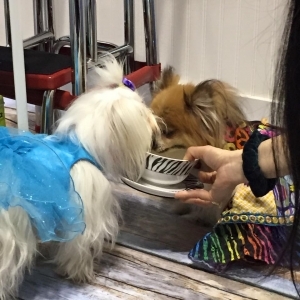 And one whirlwind later, Norris launched and presented the product at the 2015 Global Pet Expo to much enthusiasm and is pleased to see the adorable little tins of dog tea that are starting to line the shelves of boutique pet stores nationwide. She says that the idea of serving tea to your dog is sometimes met with funny reactions. But a little explanation goes a long way when you start talking about the health benefits of tea for dogs. “It’s been very well received,” Norris says. “Most of the health benefits of herbal remedies will transfer from humans to dogs. It’s really a matter of getting someone to take a chance and give it a try.” Norris has come up with several blends that range from a calming blend to ease anxiety, to joint and bone health for active dogs, to a good old fashioned freshener for when Fido’s breath has turned sour. She says for many dog-parents, sharing a cup of tea with your furry friend is something that can become a daily event. “It can be become part of a dog’s family life,” she says. “Brew yourself a cup of tea and then one for your dog.” Norris says she gives her own little doggie, Kinsley Jane, a bowl of tea daily and the pup expects it has part of her routine. Currently there are four blends of Tea For Spot, with more in the works, Norris says. The teas are available for sale on her website and she hopes to have a list of local and nationwide stores where her teas are available for purchase on her site soon. Norris’s Tea For Spot website can be found here. Check her out on Facebook and even join the Dog Tea Party on Instagram here!